My world within the arts began in High School during the time of the Vietnam War. Liberal Arts were still available in every form. I tried the mediums they offered and found I was adept at the understanding of metals and was encouraged by my Art Teacher, Mrs. O’Farrel. Commercial Art was my favorite and many paintings from that free thinking time were produced. Once realizing the metals were a stock option choice, sterling silver and solid gold were the obvious selection to see this craft to the end! In the years that followed I taught myself thru trial and error hence learning many secrets that metal smithing entailed. Traveling the Western USA in a variety of venues, from Art & Craft Shows, County Fairs, private showings and general word of mouth, I was able to sustain a lifestyle that kept me centered during the week to monitor my 2 sons and work from home, then off on the weekends for additional experiences with my clientele and my son’s experience in the real world of living by your own wit! 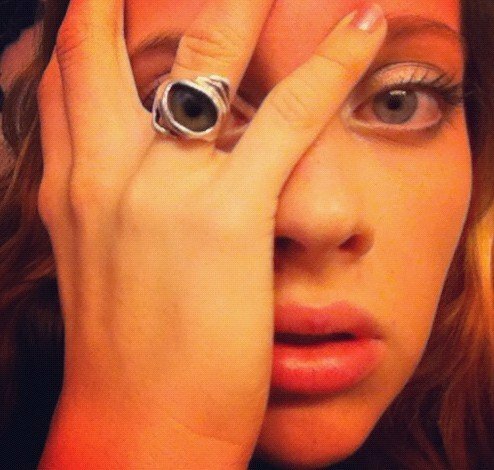 In the year, 1996, I was intrigued by the Glass Eye Ring. This was a relatively unknown concept to me and my craft and I had to search for glass eyes that could be set and once found, this began my journey into another world of creation! I continued with this company made eye, until the information highway came my way and the idea of the prosthetic eye came into view when I realized these were actual antiques produced from 1870 to 1910 when acrylic was introduced as a material that would fluctuate with the temperature changes that affected the way glass reacted within the eye socket! With time, my collections increased and the many designs that have passed thru my hands, I have come to realize the importance and actual use of the prosthetic eyes, bringing many stories from clients throughout the world and I have firmly placed myself in the middle of this exciting work. Actual glass prosthetic eyes were produced until 1910, acrylic and newer materials then replaced glass and the rest is history. This picture is one of many clients have sent me to enjoy. This happens to be my beautiful great niece, Rez Ealaíontóir, artiste extraordinaire, with the greatest image so far. I am pleased, honored and with great pleasure, offer to you pieces that will endure lifetimes of wear and many eyes of love back to you. Any question is worth an answer, please email me anytime, on any question within the metals world!